Time to round up the suspects, because something bad is going to happen in the Season 2 Cliffhanger. At least we know it will not involve Steven because he has left Denver and no one knows where he is. Fallon fears he will be gone for a long time. Not to knit-pick, but didn't Steven plead not guilty to the assault. When he doesn't show up for his trial, there will be a warrant for his arrest. Before we get to the suspect list, let's focus on something happier - Alexis's wedding to Cecil. And, where is she going to have the reception - why at her studio and the grounds of the Carrington mansion. Apparently, Cecil's mansion (which we never see) is not acceptable. Alexis claims that she is tired of boring receptions and wants a surprise. Everyone else, correctly, finds it classless. The only saving grace for Blake is that once this farce of a wedding is over, Alexis will leave the Carrington Estate. In the meantime, Blake decides to take Krystle up to some dude ranch, Sky Crest, that he is interested in buying. Fallon does not want to go as she'd like to settle in with the baby. (More like she doesn't want Krystle around the baby). Jeff sees Fallon and Blake with L.B. talking about what a little Carrington he is and becomes a little jealous. L.B. 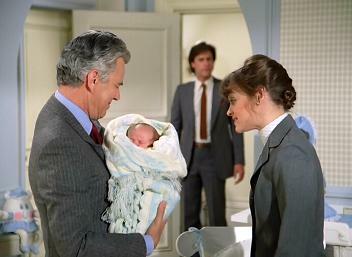 is a Colby too and Jeff wants to remind the child of that so he brings him to his father's mausoleum. At the mausoleum, Jeff runs into this creepy old groundskeeper (Suspect #1) who seems a little too interested in the security at the mansion. Jeff thinks nothing of it. Fallon had followed Jeff and later finds him at the St. Dennis Club and apologizes for being so insensitive of L.B.s two birth lines. The two, much happier, agree to go to the rectory together to discuss L.B. 's christening. Claudia (Suspect #2) is acting more erratic - if you can believe that. Joseph takes her to see Dr. Nick who observes the wound through Claudia's hair and sees that it is healing nicely. (Nick also moved where the wound was.) He also suggests that she go to the sanitarium and Claudia reluctantly agrees. Claudia does not go home with Joseph. Instead, she sneaks off to clear her checking account and gleefully counts the money on her bed. She also runs into Jeff while strolling the grounds and tells Jeff that she will not be alone. Rashid Ahmed cannot make it to Denver to see Blake. Instead, it is his brother (who happens to actually look more Arabic), Faruk Ahmed. Faruk has a deal for Blake but is light on the details. Blake assumes that Rashid probably failed to give the money to the generals as promised during the tanker deal and is trying to get Blake to bail him out. Blake will do no such thing. This angers Faruk (Suspect #3) who hopes great misery on Blake. Nick goes to see Faruk and is upset that he still has not been able to get his brother's body back from wherever in the Middle East. Faruk tells Nick that his brother was buried in a common grave. This angers Nick but Faruk tells Nick to save his anger for Blake since Blake was in his country at the time of Gianni's arrest and was told that Gianni's sentence could be lessened if Blake paid a fee. Nick, of course, believes Faruk, and rushes off to Sky Crest to confront Blake. Nick does not take the DeLorean to SkyCrest but a jeep he must have bought with his new found neuro-surgeon wealth. Krystle tells Nick that Blake went up some trail, she also walkie talkie's that information to Blake. Nick finds Blake and demands answers through a fight. Blake holds up pretty well for an old man and tells Nick that he needs to let this vendetta go and that his brother was no saint. He was dealing in drugs. 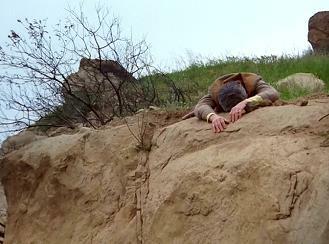 As Blake rides off, his horse is startled by a snake and he tumbles down a hill and lands right at the edge of a cliff. Nick sees him there motionless and rides off. Back at the ranch, Nick tells Krystle he did not see Blake. When Krystle acts concerned for Blake, Nick tells her goodbye. 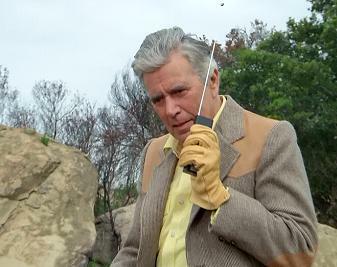 Krystle calls out for Blake over the walkie talkie, as she is apparently oblivious to the fact that there is a staff at the dude ranch that can go look for Blake. Hence, the name of this episode. Is there also some symbolism here - cliffhanger? Meanwhile, back at the mansion, Alexis continues to prepare for the wedding and who is helping out, but that creepy old groundskeeper, Al, from the cemetery. Inside the house, Mrs. Gunnerson cuts her finger and Joseph asks Susan to come take a look. Wouldn't you know it, during that time, L.B. is taken from his crib. Fallon and Jeff return home and cannot find L.B. or Susan. If only they had known at that time, Nick (Suspect #4) is on a pay phone with someone asking if they got what he asked and to bring it back to his place. Frantic, Jeff and Fallon run into Claudia who gives back Jeff his keys and says she was riding along the grounds. She also says she saw some foreign looking guy with a beard on the grounds who looked like he did not belong. Maybe he took the baby. While Blake is lying a top a cliff with a storm a coming and L.B. being kidnapped, Alexis and Cecil are celebrating the day before their wedding with some love making in the studio. Alexis is especially turned on because her private investigator was able to locate Mark Jennings. Only if Alexis would have noticed the signs that Cecil was about to have a heart attack. Cecil goes into cardiac arrest and all Alexis can do is slap him and tell him not to die before their wedding and her opportunity to destroy Blake. Cecil, you may be better off just dying now. Alexis: Questions, questions. Blake, you know I could never bear answering questions so early in the morning. Remember? Fallon: I thought I told you that my son is not to be left alone. Susan: Mrs. Colby, I was only out of the room for a few moments. Please remember, I'm a registered nurse, not a bonded slave. Faruk: I could lose my brother because of you, Mr. Carrington. How would you feel to lose someone close to you? Blake: Get out of here. Faruk: This I promise - the day you find out how it feels, I will smile at your agony. Nick [to Jeff]: Come off it, pal. You don't have a wife. You got yourself a Carrington. And, about your baby. Does he really belong to you or is he like everything else in that mansion, in this building, practically everywhere you look. Is it another possession of Blake Carrington's? Alexis: Come on, let's go back to the studio, I want you to see my wedding dress. Cecil: I've already seen it, Alexis. Alexis: Well, I know you've seen it on me. Now, I want you to see it off me. Jeff: I just hope you find someone soon, so you won't have to be alone anymore. Claudia: Alone? Well, I won't be alone. But, thank you. That's sweet of you. Really. You're a sweet Colby. There are some. Alexis: [Slapping Cecil] Cecil, you can't die on me. We are getting married tomorrow. You can't die on me. I need you. Don't you die on me. I need you to get Blake.